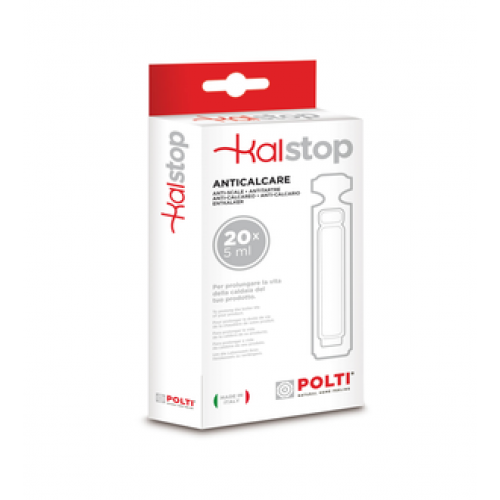 To prevent limescale build-up and to improve steam emission, Polti suggests using Kalstop. Kalstop is a product of plant origin, not harmful to human health, readily biodegradable and therefore harmless to the environment, that prevents limescale build-up for longer boiler life. It also helps steam flow better and keeps applicances running efficiently, because it keeps steam passages clear, helping reduce energy consumption by permitting efficient operation. for models with traditional boiler, add one half or one phial of Kalstop whenever you fill the boiler, depending on how hard your water is. for cointinuous refill models, we suggest using one phial in five liters of water.